LET IT BE HEARD. The Cotabato Light team assisting the church workers to put up the heavyweight bronze-tower bell at the Rosary heights church. 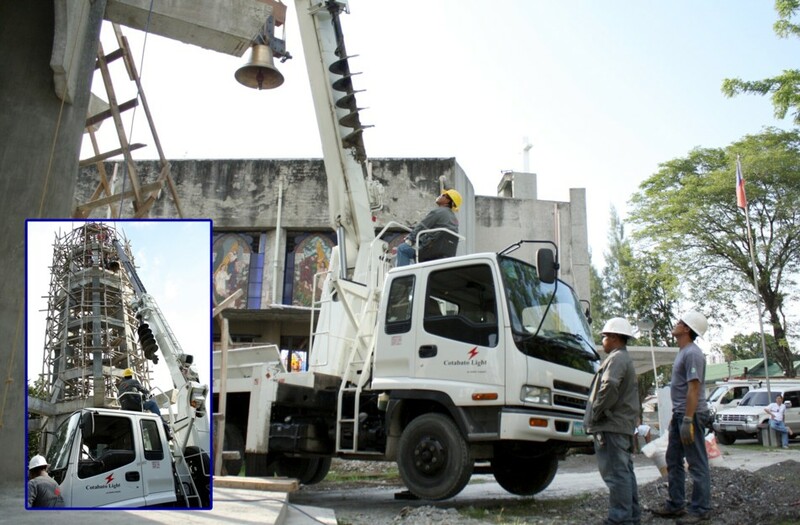 On September 16, Cotabato Light and Power Company with the use of its Crane Boom Truck assisted the Rosary Heights (RH) Church in putting up its bell tower that’s weighing about 2,000 kilograms. “We can hardly put up the church bell-tower because of its tremendous weight. It is too heavy for our men to carry and very risky too! Thus, we ask for assistance from Cotabato Light. And, indeed we are very thankful that Cotabato Light was there to give us a helping-hand to finish this noble project for the Christian community. Now, the people God can hear clearly and loud the calling of the Church.” The RH-Church bell tower project engineer said. The Cotabato Light responding team was headed by Transmission and Distribution (T&D) Supervisor Bernabe Parcasio with Linemen Jeffrey Escalona and Basilio Tanara.